One of the biggest mistakes women make is not negotiating compensation whenever they have an opportunity to do so. Before I became an executive coach and trainer, I was the head of human resources at Barneys New York, TV Guide and USA Networks. In that capacity, when I was recruiting executives, I was surprised to find that, even at very senior levels, women often simply accepted the first offer that they received without attempting to negotiate any aspect of the offer. That almost never occurred with men. 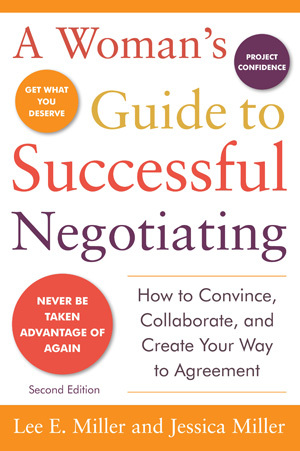 In researching our newly released book, A Woman’s Guide to Successful Negotiating (McGraw Hill 2010) we found that failing to negotiate compensation not only hurt women financially, it held them back in their careers. Notwithstanding, many people, especially if they are currently unemployed feel that they cannot negotiate in this job market. That is simply not the case. How and when you discuss compensation, however, is important. While it is extremely difficult to find a job in this highly competitive job market, precisely because the hiring process is so long and involved, once you have been selected as the candidate a company wants to hire you are in an excellent position to negotiate. Similarly when you are asked about your salary history seek to delay that discussion. If you cannot, reiterate that “It is not about the money, then give provide an answer in general terms. If for example, your most recent salary was $80000 but you are now willing to accept less, describe your salary as being in the mid to upper five figures including bonus, stock and other perks (if applicable). Note that you are flexible in terms of how your compensation is structured. On the flip side, if you were making $28,000 but the market rate for your position is $40,000, you can use the same technique in reverse. In that instance when giving your approximation you can refer to “total compensation” in the mid five figures including the value of benefits, bonus and perks (if applicable). It can also helpful if you were underpaid in your last full time job, to find some part time or consulting work which pays a high hourly rate. This is often possible because the job is temporary and offers no benefits. You can then annualize that rate when you are referring to your most recent work. People almost never lose a job offer because of what they ask for. When they do, it usually is because of how they ask for it. If you provide reasons to justify your requests, you may not get everything you want, but you will usually get something, and you will also gain respect for how you go about asking. Treat compensation discussions as a collaborative effort. You might say, “Here are the problems with the offer. What can we do to overcome them?” or “I have another offer, but I really want to work here. Is there any way you could make your offer more competitive?” You do not want to come across as strident but you need to be firm about your expectations. Never threaten or make “demands.” This is particularly important for women, because they are held to a different standard than men and are usually expected to adopt a more relational negotiating style. Before you enter into salary discussions it is important to know what is reasonable to ask for. You can do that by doing your research online. There is a tremendous amount of information online as to what the market rates for particular positions are. Websites like salary.com, payscale.com and simplyhired.com, to name a few, all offer information on market rates for various positions. When it comes to negotiating compensation, information is power. Determine what your skills and experience are worth in the market, and do not accept less. Your current salary will normally weigh heavily in determining the amount you receive. If you are being paid below market value, and the company bases its offer on your current compensation, this will work to your disadvantage. For this reason, it is important to anchor salary discussions based on market value rather than on your current salary. To do that, you must know the range of salaries being paid to others with similar skills and experience. When negotiating compensation, the only way to be certain that you get what you deserve is to know your market worth, to understand how to negotiate compensation, to firmly and creatively negotiate a compensation package consistent with that market value, and to be willing to walk away if you do not get it. Adapted from the just released A Woman’s Guide to Successful Negotiating (McGraw Hill, 2010) by Lee E. Miller and Jessica Miller. Lee E. Miller is the Managing Director of NegotiationPlus.com and an adjunct professor at Columbia University. He is a career coach, corporate trainer and professional speaker. He is also the author of Get More Money on Your Next Job… In Any Economy (McGraw Hill, 2009). Jessica Miller is a Director at Cushman & Wakefield in their McLean, Virginia office, where she works as a commercial real estate advisor specializing in corporate tenant representation services and landlord representation services. She is also Lee’s oldest daughter.